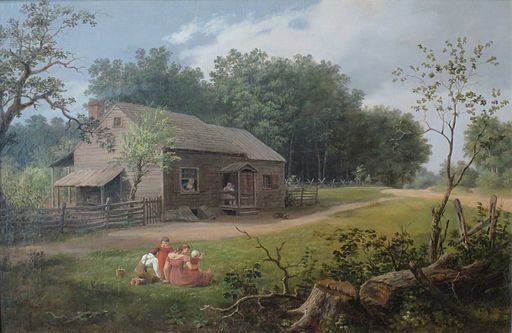 Thomas Birch "Cabin with Children Playing"
The quick report of a pistol rang through the quiet autumn night. It was no unusual sound in the unsavory quarter where Dr. Chevalier had his office. Screams commonly went with it. This time there had been none. Midnight had already rung in the old cathedral tower. The doctor closed the book over which he had lingered so late, and awaited the summons that was almost sure to come. As he entered the house to which he had been called he could not but note the ghastly sameness of detail that accompanied these oft-recurring events. The same scurrying; the same groups of tawdry, frightened women bending over banisters--hysterical, some of them; morbidly curious, others; and not a few shedding womanly tears; with a dead girl stretched somewhere, as this one was. And yet it was not the same. Certainly she was dead: there was the hole in the temple where she had sent the bullet through. Yet it was different. Other such faces had been unfamiliar to him, except so far as they bore the common stamp of death. This one was not. Like a flash he saw it again amid other surroundings. The time was little more than a year ago. The place, a homely cabin down in Arkansas, in which he and a friend had found shelter and hospitality during a hunting expedition. There were others beside. A little sister or two; a father and mother--coarse, and bent with toil, but proud as archangels of their handsome girl, who was too clever to stay in an Arkansas cabin, and who was going away to seek her fortune in the big city. "The girl is dead," said Doctor Chevalier. "I knew her well, and charge myself with her remains and decent burial." The following day he wrote a letter. One, doubtless, to carry sorrow, but no shame to the cabin down there in the forest. It told that the girl had sickened and died. A lock of hair was sent and other trifles with it. Tender last words were even invented. Of course it was noised about that Doctor Chevalier had cared for the remains of a woman of doubtful repute. Shoulders were shrugged. Society thought of cutting him. Society did not, for some reason or other, so the affair blew over. Add Doctor Chevalier's Lie to your own personal library.